Are you ready for some foooooootball?! Happy Super Bowl Sunday y’all! I’m pretty sure that today should be a holiday and I should have the entire day off, plus a paid holiday…don’t you think so? I can’t wait to eat, drink, and enjoy the game. This morning for breakfast I went with a favorite, pancakes! 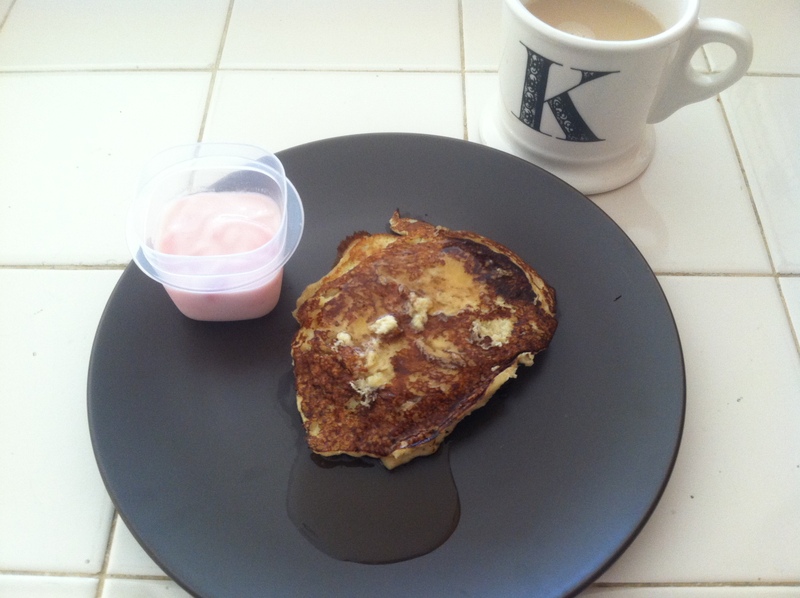 I decided to try the 2-ingredient pancakes that have been popping up all over the blogosphere. I love bananas and I’m already a fan of mashing them into my full pancake batter and I like eggs so what the heck, why not! I mashed one whole banana in a bowl and combined it with a whole egg. 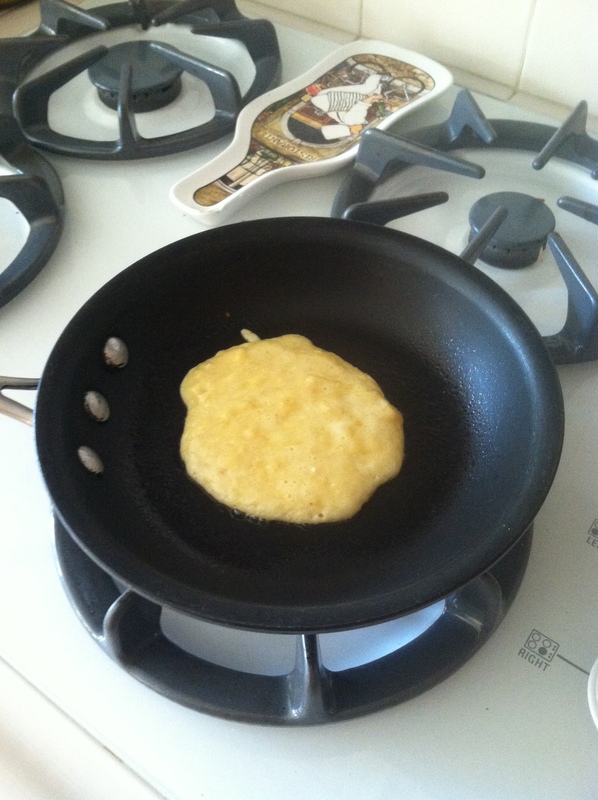 I was left with a somewhat thick batter that I then poured into a heated pan. Either I’m a complete idiot or these pancakes are just really hard to flip (someone tell me they’re just hard to flip) and it ended up taking 2 spatula’s to flip it and even then it turned out janky…yum. I used up all the batter which made a whopping 2 cakes, k at this point I’m just annoyed with flipping both of them. Alongside my cakes was some strawberry yogurt and the standard cup o’ joe! The verdict: They’re okay. As a girl who loves light and fluffy pancakes these just didn’t compare. But for just being egg and banana they’re pretty stinkin’ delicious! I’m a fan (kinda). The second part of this post is inspired by one of my favorite bloggers, Emily! If you haven’t check out her blog yet, get to it she’s one fabulous lady! I usually make a list of goals in my head each month but as the month carry’s on I tend to forget them and I tend to forget to check back on my progress so I’m hoping that if I write them down here, then y’all can keep me accountable! 1. Keep in touch with everyone. School is back in session and I’m working. Basically, I’m busy. really busy. When I get busy I tend to block friends and family out and that is no bueno. I need to make a conscience effort to keep in contact with them and with all of you! 2. Donate Blood. Random-ish. But I’m all for saving three lives. 3. Turn off by 10 p.m. A good one from Emily. I tend to come home, get on my laptop, read blogs, browse Pinterest, Facebook, you know that kinda of stuff and before I know it, it’s midnight. I’m trying to workout in the morning more often and getting to bed earlier will make it easier to rise with the sun. 4. Get up early to workout. I’m talkin’ 6 a.m workout. yikes, my sleep loving self is in a panic right now. I’ll check back in with y’all in mid-month so we can see how well I’m sticking to these goals and then I’ll recap them at the end of the month…sound like a plan? Good! Reader Questions: What are your February goals? Hi! I'm Kelsey! I'm a 20 year old student living in sunny Southern California! Welcome to my blog! Kelseyruns follows my love for running, fitness, food and baking. As well as my love for my family and friends! Feel free to email me at kelseyruns@gmail.com! I'd love to hear from y'all! Achieving a healthy lifestyle one day at a time.